2010 Service of Living Tradition sermon to reflect the UUA’s commitment to the next generation of ministry. The Reverend Paige Getty, who has served the UU Church of Columbia, MD since 2003, will preach the 2010 Service of the Living Tradition. Rev. Getty, who is expecting her second child in February, will be on maternity and sabbatical leave between February and July 2010. 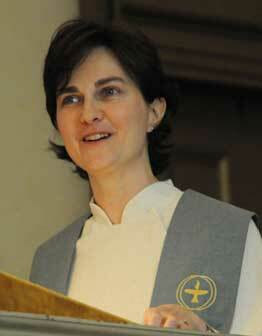 Her sermon at General Assembly will serve as a bookend for this period of focus and reflection. Getty believes the sermon will, to some extent, be the culmination of a review of her first seven years of parish ministry. Her selection by President Morales highlights his focus on the future of Unitarian Universalist ministry. During the 2009 campaign, then candidate Morales observed, “We are going to lose half our ministry during the next presidency. Three out of eight of our ministers are 58 years of age or older. You throw in our regular normal churn that occurs, half of them are going to be gone, and disproportionately those serving our mid-size and larger churches. It’s a perfect storm, and a fabulous opportunity if we take it.” Rev. Morales has promised “to develop a strategy for ministry for the next generation” and purposely sought a preacher for the service who was in her first decade of ministry. The Service of the Living Tradition, the annual worship service honoring the ministry of fellowshipped and credentialed UU religious leaders, will be held on Thursday, June 24 at 7:30 p.m. in the Minneapolis Convention Center. It is free and open to the public.